The desktop client export dialog allows you to export files from Elvis to Enterprise, with the possibility to create Dossiers on the fly and select the Enterprise Brand, Category, Issue, etc. For Elvis 1.0 - 3.x the export always creates a copy of the file in Enterprise when exporting files from Elvis to Enterprise. This is changed with Elvis 4.0, which introduces a new method that only creates a reference in Enterprise to the file in Elvis. 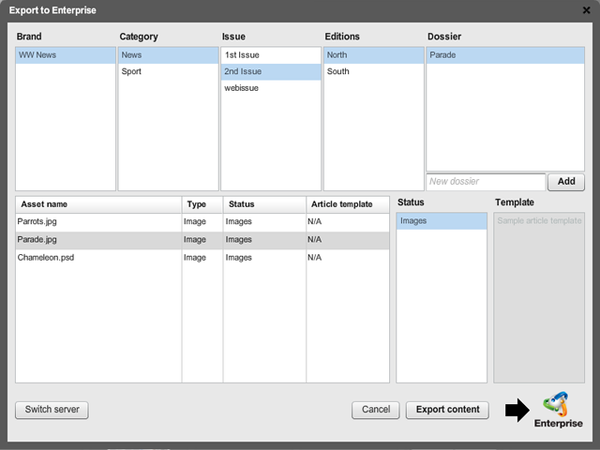 You can find more information about this new method in Elvis Content Source plug-in for Enterprise. # a copy of the asset in enterprise by default. # no effect on exporting to Enterprise 7 or lower. # exporting a copy or a shadow object to Enterprise. You can setup a connection to the Enterprise Server on the client machine or on the server. Elvis uses the WWSettings.xml file to retrieve information on the available Enterprise Server(s). Inside the export dialog, a user can select an available Enterprise server and login using their Enterprise credentials. If both the server and client have a WWSettings.xml file, the files will be merged. On duplicate entries the client setup is preferred over the server setup. To set up the export correctly you will need the WWSettings.xml file from your Enterprise installation. For more information about this file and it's configuration please refer to the Enterprise documentation. The WWSettings.xml file might be serving several Enterprise servers, all of those servers will show up in Elvis when you're exporting. Open the Elvis server configuration from the Windows Start menu or from your Elvis server console on Mac OS X. For the moment only the ServerInfo entries are used by the Elvis sce-export, any other configuration settings are ignored. Restart the server to enable the config settings. Suppose the URL changes from HTTP to HTTPS, will that then not work, as by default, <SCEnt:SSL enable="true"/> is disabled in WWSettings.xml? Should <SCEnt:SSL enable="true"/> maybe be enabled by default, as it doesn't has in default cases, and provides actual benefits?